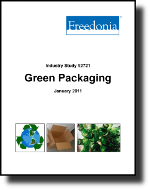 US demand for green packaging will rise 3.9 percent annually through 2014, outpacing growth in overall packaging demand. The fastest gains are anticipated for degradable packaging -- from a relatively small base -- and for plastic recycled content packaging. This study analyzes the $34 billion US market for recycled content, reusable and degradable packaging. It presents historical demand data ( 1999, 2004, 2009) and forecasts for 2014 and 2019 by material (paper, metal, plastic, glass), product (e.g., drums, reusable plastic containers, intermediate bulk containers, film, ring carriers, containers, cups, plates and bowls, loose-fill) and market (e.g., food, beverages, consumer products, shipping, chemicals, foodservice). The study also considers market environment factors, discusses source reduction and recycling activity, details industry structure and profiles 48 industry competitors, including Coca-Cola, Procter & Gamble and Wal-Mart.